eCite - Antarctic sea ice - A polar opposite? 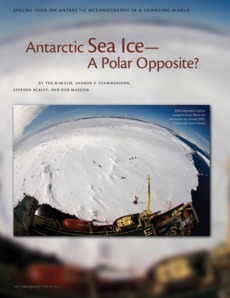 Antarctic sea ice - A polar opposite? As the world's ice diminishes in the face of climate change - from the dramatic decline in Arctic sea ice, to thinning at the margins of both the Greenland and Antarctic ice sheets, to retreating mountain glaciers the world over - Antarctic sea ice presents something of a paradox. The trend in total sea ice extent in the Antarctic has remained steady, or even increased slightly, over the past three decades, confounding climate model predictions showing moderate to strong declines. This apparent intransigence masks dramatic regional trends; declines in sea ice in the Bellingshausen Sea region that rival the high-profile decline in the Arctic have been matched by opposing increases in the Ross Sea. Much of the explanation lies in the unique nature of the Antarctic sea ice zone. Its position surrounding the continent and exposure to the high-energy wind and wave fields of the open Southern Ocean shape both its properties and its connection to the atmosphere and ocean in ways very different from the Arctic. Sea ice extent and variability are strongly driven by large-scale climate variability patterns such as the El Niño-Southern Oscillation and the Southern Annular Mode. Because many of these patterns have opposing effects in different regions around the continent, decreases in one region are often accompanied by similar, opposing increases in another. Yet, the failure of climate models to capture either the overall or regional behavior also reflects, in part, a poor understanding of sea ice processes. Considerable insight has been gained into the nature of these processes over the past several decades through field expeditions aboard icebreakers. However, much remains to be discovered about the nature of Antarctic sea ice; its connections with the ocean, atmosphere, and ecosystem; and its complex response to present and future climate change.